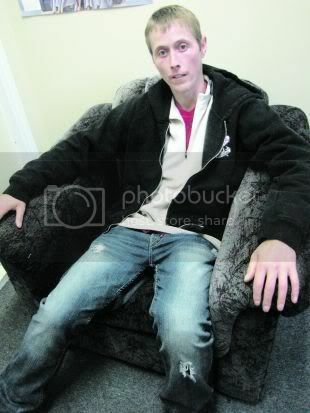 Grand Falls-Windsor – Meet David Shea and you might notice the skin on his face and hands is taut and pale. It’s not for lack of time spent outdoors, but because of an uncommon condition known as scleroderma – a chronic systemic autoimmune disease, mainly of the skin. Up to 40,000 Canadians have the disease, which can make life very uncomfortable. That’s why the Grand Falls-Windsor native, who now lives in Halifax, promotes the use of medical marijuana to the public as well as to health professionals – not as a way to get high, but as a safe drug that can alleviate the symptoms of various diseases. He is the head of patient advocacy with the organization Maritimers Unite for Medical Marijuana (www.mumm.ca). He was studying accounting, but had to go on a disability pension when he developed the disease. He tried to work at first, but one of the symptoms when the autoimmune system attacks the body is that scar tissue develops. In Shea’s case, the symptoms made work too difficult and painful. “The doctors prescribed me medications, but I’ve always been wary of drugs, so I would research what medication they would recommend to me,” he said. He discovered that medical marijuana was thought to help alleviate several symptoms among people with serious medical conditions, like cancer. Shea said he knew that it would help him improve his appetite, and before he started taking cannabis as prescribed, he ate rarely, and with chronic pain. He doesn’t “smoke up” like recreational marijuana users. He gets it in raw, unprocessed form but usually ingests it in baked cookies or something similar. Medical marijuana is approved for use by Health Canada, and people who want to grow the plant in order to supply the market for that purpose have to obtain a government licence approving the cultivator as a certified grower. “That kind of intoxication is something that happens the first week of using it, but if you’re using it on a continual basis, that doesn’t happen anymore,” he said. As a patient advocate, he has worked with other patients who have seen doctors who have told them the product is illegal, which isn’t the case. “My hope is to educate patients and let doctors know there is a legal program to allow them to recommend cannabis,” he said. Shea buys his supply from Health Canada. “I’ve never met people who recommend opiates for pain, but I’ve met loads of patients who recommend cannabis,” he said.